Do you prefer to live a sophisticated country club lifestyle among lakes and close to the Gulf Coast, only 20 miles from Sarasota and 50 miles from the Tampa Bay Area, which is Florida’s second most populous metropolitan center? If so, Lakewood Ranch is the ideal award-winning community for you. 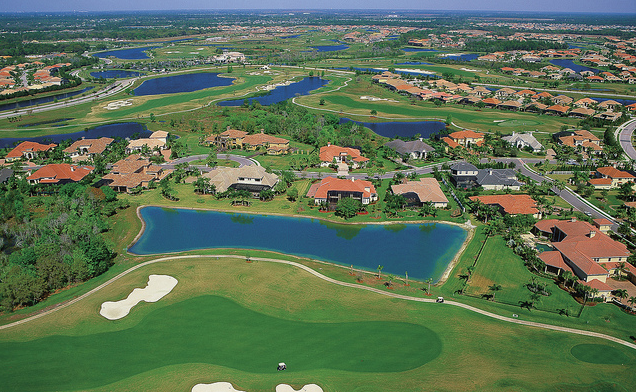 Its 17,500 acres including three 18-hole golf courses with 36 world-class private holes of golf, 18 tennis courts, and 150 miles of trails all contribute to making Lakewood Ranch Florida’s largest green-certified community. Additionally, it is soon expected to be the largest in the whole United States. Different custom “villages” provide every type and architecture of home you could possibly want. Do you desire a spacious modern estate with a large backyard on a tree-lined street in a gated community? Or do you want a cozier townhouse with easy access to entertainment and restaurants? Or a detached villa in an area with a private Tuscan-inspired club? Or something in between? In addition to those already mentioned, there are over 80 health clubs, cricket, polo, those trails for walking and biking, free monthly Music on Main concerts, and other events and festivals that all promote a healthy green active lifestyle. Your children can receive top-notch excellent schooling right in the community in the 16 preschools and early learning education facilities, seven private schools, one charter school, and six higher education campuses. Right at your fingertips you have eight top-of-the-line shopping centers with high-end boutiques and trendy shops. There are hundreds of fantastic restaurants as well as organic supermarkets, antique stores, farmer’s markets, a florist, a jewelry store, wine shops, salons, spas, an ice cream parlor, theaters, art gallery showings, and many more enchanting businesses.